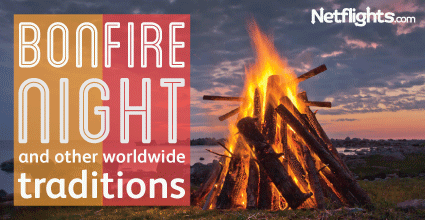 From burning guys to an annual food fight, read about some of the varied traditions celebrated throughout the world. Bonfire Night – otherwise known as Guy Fawkes Day – is celebrated in the UK on November 5th to note the failed Gunpowder Plot of 1605. The plan, concocted by Catholic activists protesting intolerance, was to blow up Westminster Palace during the state opening of Parliament, when the Protestant King James I would be present. Fawkes was in charge of the explosives and was in the cellar under the House of Lords ready to set off the fuse when he was discovered. He later jumped to his death before he could be sent to the gallows. From 1606, the date has been annually marked. Today, people set off fireworks and build bonfires where straw dummies known as a ‘guys’ are burned; while the Houses of Parliament are still ceremoniously searched with lanterns by the Yeoman of the Guard. Celebrating the triumph of good over evil, Holi is held throughout India on the day after March’s full moon (in 2016, that’s March 24th). The festival of colours is held in honour of Lord Krishna, an incarnation of Lord Vishnu, as it was through absolute devotion to him that the demoness Holika was destroyed. The festival also marks the end of winter. After a Holika bonfire on the first day, the real festivities kick off. People throw coloured powder and water all over each other during street parties in which everyone is involved, from young to old, male and female. If you visit, prepare to get saturated and covered from head to toe in coloured powder – no one is exempt. Held on the last Wednesday of August, La Tomatina is billed as the ‘world’s biggest food fight’ and takes place in Bunol, near Valencia in Spain. The tomato food fight tradition started in 1944 or 1945, but the origins are unclear. Various suggestions include a reaction to a bad musician, a truck spillage that resulted in a food fight, or the locals turning against the town council at a festival. However it started, the tomato fight became a yearly activity and today thousands come from all over the world to take part. Over 100 tons of soft, over-ripe tomatoes are hurled during La Tomatina. In recent years the number of participants has been scaled back to 20,000 and the tomato throwing is restricted to one hour. At the centre of the town is a greased pole with a ham at the top; traditionally, the throwing started when a person reaches the ham, although now it’s water cannons that signal a start to the food fight. Afterwards, the city is cleaned with fire truck hoses. Easter in Guatemala’s Antigua is quite an event, whether you’re religious or not. The processions of purple-robed men, floats, carpets of sand, sawdust and flowers, and wafting incense are based on Andalusian tradition, brought over by the Spanish missionaries in the 16th century. On Palm Sunday, floats bearing images of Jesus and the Virgin Mary are carried through the streets by 50 to 100 people, and this continues through to Good Friday. On Friday the city wears black, and crepe paper is strung through the streets. A crucifix is carried to the church. The next day is dedicated to the Virgin Mary and on Easter Sunday a festival with fireworks brings the week to an end. The ‘carpets’ – or alfombras – are painstakingly created during the night before the processions, only to be destroyed the following day; this is seen as a symbolic act of sacrifice.